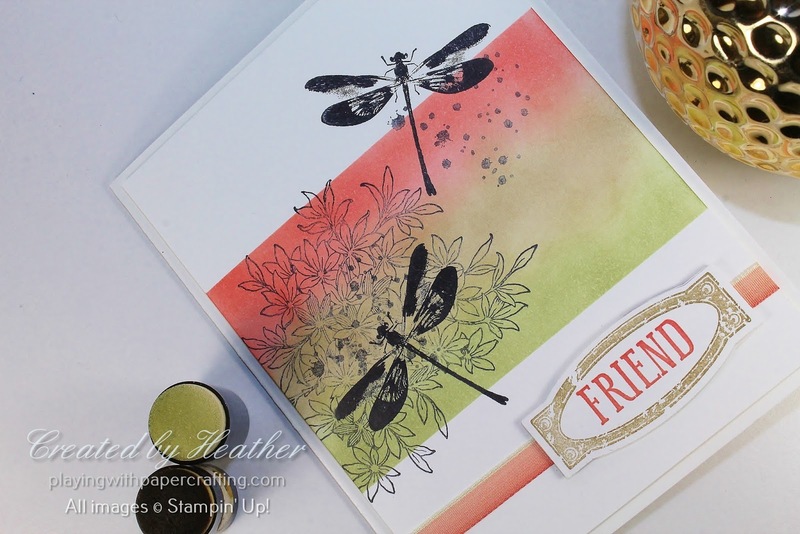 The colours from this challenge are fairly intense unless they are softened a bit, and sponge daubers are the ideal way of softening them. 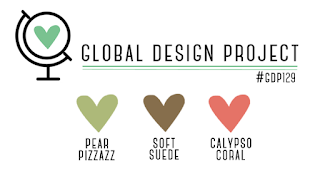 They can then blend together in a more muted and natural way. The sharp edges on the top and the bottom is created with Post It tape. 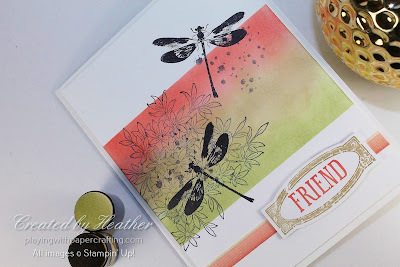 The Awesomely Artistic images were stamped using Basic Black Archival ink right on top of the sponging. The bush is a large stamp and I had some issues with having it inked up properly in the middle of the stamp or not getting enough pressure on it. I have a wood mount set and so I couldn't use my Stamparatus, but if my set was clear mount, it would have been a cinch to reink and restamp the image to get better coverage. As it was, I covered it up with a dragonfly image, which I likely would have positioned there anyway. 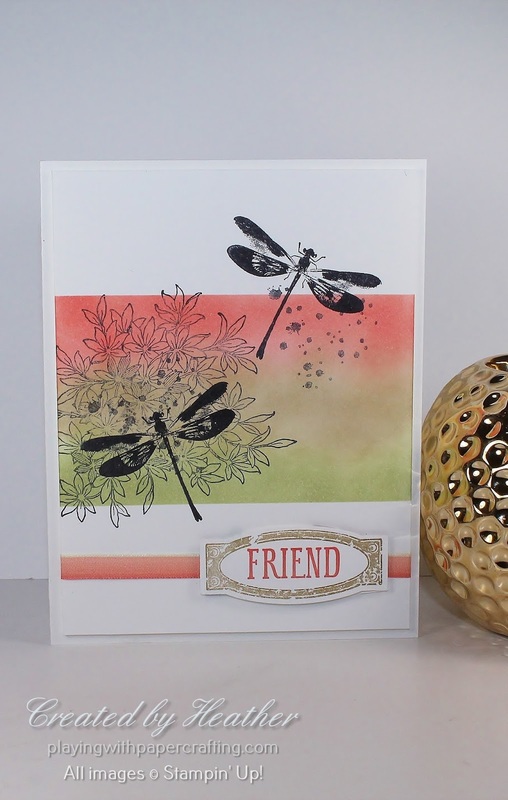 I also added some of the splatter images, stamped off once, near both dragonflies. This further helped to cover the area not completely inked. This was the perfect occasion for the Calypso Coral Ombre ribbon, wrapped just around the front panel of Whisper White cardstock and fastened with Fast Fuse on the back. 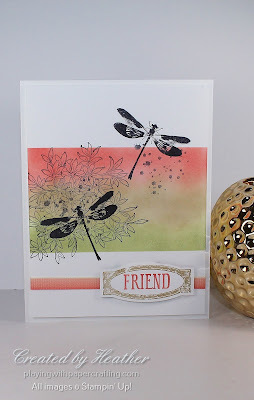 I tried stamping the sentiment frame and word in Basic Black Archival ink first, but it just looked too stark and took away from the main image, so I tried again using Soft Suede ink for the frame and Calypso Coral ink for the sentiment itself. The frame is die cut using the retired Project Life Cards and Label Framelits, which I will probably never let go because they are so darned useful for the larger sentiments. 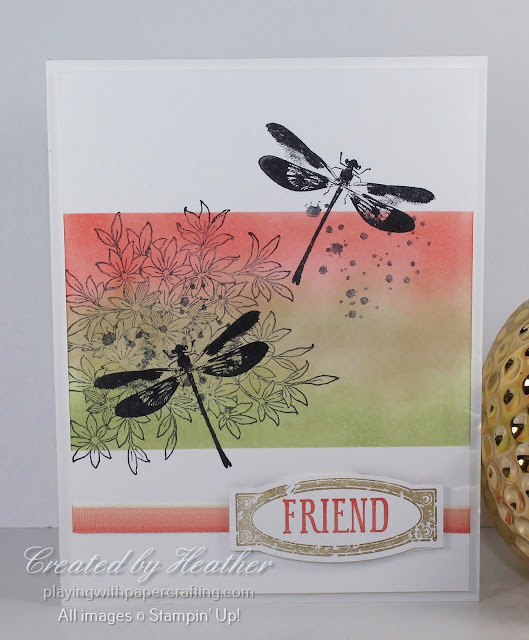 It is mounted using Stampin' Dimensionals, as is the whole image panel itself. From March 11 to May 10, if you become a new subscriber to Paper Pumpkin, the once a month subscriber kit delivered right to your door with tons of creative fun, your first two months will be 50% off. Just use the Code: SAVEFIFTY0418 when you sign up and you'll only pay $13.48 a month for your first two months! There are only 20 More Days left of Sale-A-Bration!! And I'm offering an extra incentive to help you earn your Sale-A-Bration Rewards. From now until March 31st at 11:00 pm, you will earn DOUBLE Papercraft Cat Reward Points for your purchases of $60 or more. That means when you spend $60 on one order you will earn 4 Papercraft Cat Reward Points instead of 2. When you spend $120 on one order you will earn 8 Papercraft Cat Reward Points instead of 4. Up until $60 you will earn the regular 1 reward point per every $30 spent per order, but once you hit $60, those reward points will start doubling! It's a great way to speed up earning your $50 gift certificate once you collect 20 Papercraft Cat points! Get your orders in to me as soon as possible because sometimes supplies of popular Sale-A-Bration Rewards run out before the end of the promotion! And everyone who has earned a Sale-A-Bration reward or who has signed on to my team during Sale-A-Bration will earn an invitation to my exclusive Celebrate Sale-A-Bration Party, an afternoon full of fun, games, food, stamping, and many great door prizes featuring the Sale-A-Bration Rewards that I earned during this period. Don't miss out on this!